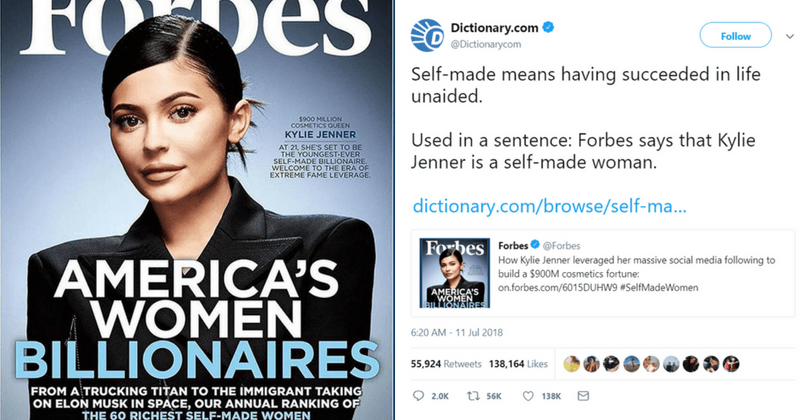 Kylie Jenner was called a 'self-made billionaire' by a magazine, and a dictionary is rolling its eyes now! Being a 20-year old millionaire, she has managed to lure millions of people by her pouting selfies, with captions about her Kylie Cosmetics shades. You know things are going off the hook when a dictionary weighs in to clarify certain things. It is something we are not accustomed of seeing on social media. Recently, Forbes magazine made it to the headline for posting their cover picture of Kylie Jenner with a caption "At 21, she's set to be the youngest-ever self-made billionaire". Well, does that make you cringe? Apparently, a lot of people are losing their mind after reading this post, along with Dictionary.com. Let's check the meaning of "self-made". According to Dictionary.com, the definition of self-made is having succeeded in life unaided. After Forbes magazine launched its cover photo which read, "At 21, she's set to be the youngest-ever self-made billionaire welcome to the era of extreme fame leverage" is something hard to digest. To this, Dictionary.com trolled the magazine for misusing the word "self-made". Now, let's look at the history and the background of the cosmetic brand's queen, Kylie Jenner. Kylie Jenner is an inheritor of immense wealth and privileges bestowed to her by her parents, Kris Jenner and Caitlyn Jenner. She was part of one of the most famous reality show 'Keeping Up With The Kardashians', that had millions of followers. Being a 20-year old millionaire, she has managed to lure millions of people by her pouting selfies, with captions about her Kylie Cosmetics shades. Kylie has recently launched "Kylie Cosmetics" products in the market which people are going crazy for. There are 110 million followers on Instagram and even more on Snapchat. Being a sibling of supermodel Kendall Jenner and half-sister of Kim, Kourtney, Khloe and Rob Kardashian, it would be an unwise thing to say that Kylie made it till here on her own. Not just the Dictionary trembled after reading Forbes magazine cover, but people's reaction and disappointments also made it to the limelight. Some people really got angry and couldn't stop themselves from showing their outrage on Twitter. And some, couldn't stop themselves from being sarcastic. After all of this, Dictionary.com didn't stop there yet. Soon it posted about how the search of the meaning "Self-made" has surprisingly increased after the news. The entire incident was a little disappointing for people who actually work their best to achieve something in life. It is ironical, how Forbes, one of the leading magazine, could buy something like that, no matter how famous a Kylie is. It is something that devalues the hard work that people put in their work without having any support- be it financial or mental. It would not be a wrong thing to say that, no matter how rich people are in this world, they do deserve appreciation and acknowledgment. However, for a celebrity who was born with a silver spoon, is being called a "self-made" by a leading magazine, is kind of sad for half of the population in this world, who are working day and night, and striving for something which might not be even half of what Kylie was born with.